What’s going on with the latest Ebola outbreak? On May 8, 2018, the Democratic Republic of the Congo (DRC) declared a new outbreak of Ebola virus disease (EVD) centered on the market town of Bikoro, near the DRC’s border with the Republic of Congo. The Ebola virus, which spreads through contact with bodily fluids, causes severe illness which is often fatal if untreated. The 2014–2016 West Africa outbreak, the largest in history, killed more than 11,000 people. As of a May 28 report from the World Health Organization, the DRC outbreak included 51 cases and 25 deaths. This is DRC’s ninth Ebola outbreak since 1976; the most recent outbreak occurred in 2017. Here, two Ebola experts, John Connor and Nahid Bhadelia, discuss the unfolding situation in the DRC. Connor is an associate professor of microbiology, and an investigator at the National Emerging Infectious Diseases Laboratories (NEIDL), who studies better ways to diagnose Ebola virus disease. Bhadelia is an assistant professor in the section of infectious diseases, and the medical director of the Special Pathogens Unit at Boston Medical Center, which is designed to care for patients with highly communicable diseases. During the West African outbreak, Bhadelia made four trips to Sierra Leone to care for patients, work with survivors, and collect public health data. I was surprised to learn that this is the ninth Ebola outbreak in the DRC. The others were contained pretty quickly. Do you know why? Bhadelia: First, they were in rural areas. It’s easier to quarantine an entire rural area, and DRC’s road systems aren’t as good as West Africa’s road systems. One of the issues in the West Africa outbreak was that people were very mobile because of the good infrastructure. Isn’t that ironic? DRC doesn’t have that. But the DRC has also seen this disease in large cities. I think twice before, it’s gotten into Kinshasa, and they’ve handled it. The DRC government is used to these outbreaks. They also have healthcare workers who are used to thinking of Ebola, and they know the drill in terms of isolating people, and they have set networks for laboratory diagnostics. I understand that an Ebola vaccine has been deployed—is this the first time? Connor: This is the first time the vaccine has been proactively deployed. Towards the tail end of the outbreak in western Africa, they deployed this vaccine that they’re using now, in a Phase 3 clinical trial. What they did was something called a “ring vaccination trial”—someone is sick, you identify the people whom they contacted, and then you identify who those people contacted, and you try to vaccinate in a ring around that one case. The encouraging part is that it looked like it provided protection. Would it be effective against different strains of Ebola? Connor: Ebola comes in all kinds of flavors; Zaire and Sudan and Bundibugyo being the ones that have caused significant outbreaks. The vaccine that is being deployed only works against the Zaire strain. The 2014 outbreak was Zaire, the current outbreak is also Zaire. Where is this vaccine going, exactly? Connor: They were very public about it being brought in, and nurses and doctors were vaccinated first. Then the plan is to do a ring vaccination. I’m interested in how well that works. I can imagine that people might be very disappointed if it doesn’t. So people should still be taking precautions, even if they’ve been vaccinated? Bhadelia: My worry is that people get this vaccine and then they let their guard down. A vaccine is not the one-shot bullet that’s going to stop the entire outbreak, unfortunately. Look at other diseases like yellow fever and cholera. We have vaccines for those diseases, and yet there are outbreaks all the time. 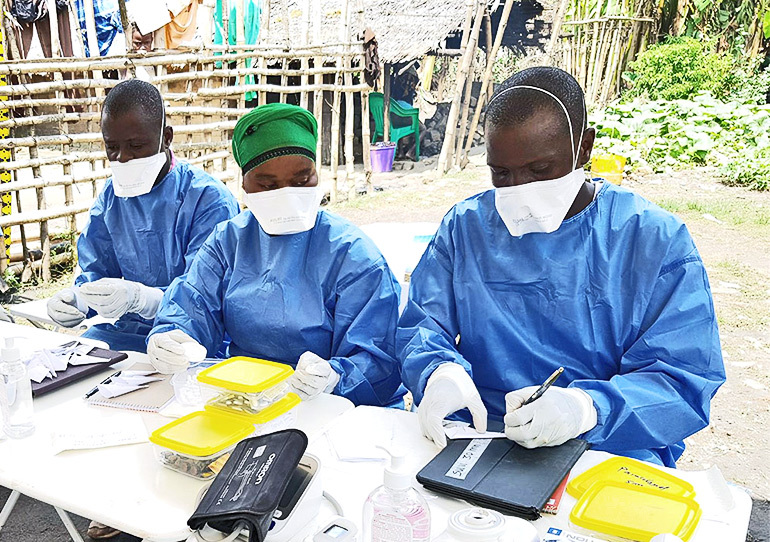 A huge part is getting the vaccine to people who need it, and then continuing the basic outbreak response and control measures, like finding people who have the disease, maintaining good water and sanitation, and all that stuff. It seems like the response to this outbreak is more proactive with those measures than they were in the West Africa outbreak. Is that your sense as well? Connor: DRC has a really good record of being on top of it. There is also a very good education campaign throughout the country, showing people how to change their behavior when there is an Ebola virus outbreak. Bhadelia: It’s spread through body fluids—touching somebody who might be sick, who might have the virus, and getting their bodily fluids on you. The major way that people get it is caring for people who are sick. Or, if there is an area that has not maintained good sanitation and has tons of virus in the environment—that’s another way to transmit it. What do you hope will happen with this outbreak over the next few weeks or months? Connor: The DRC is the first responder, and as they are responding, other organizations come in and prepare to help if that’s needed. And if everything works out the way we all hope, everybody shows up with huge backpacks and suitcases full of stuff that would help, and they’re not needed, and they turn around and go home. That’s the best-case scenario. What’s the worst-case scenario? Bhadelia: I think it’s good to not become overconfident and say, “We have this in the bag.” Some of the scenarios that we saw in West Africa are appearing, where you’re seeing some distrust. Family members are pulling their people out of Ebola Treatment Units (ETUs). In a recent case in the DRC, patients were busted out of the ETU by their family members on motorcycles and taken to a church, where 50 people prayed over them. And by the time they were discovered, one of them had already passed away and the other one was in the process of dying. And when patients die with Ebola, that’s when they have the most amount of virus in their body. And so now you’re talking about 50 new contacts. And so I think that the pressure needs to stay on. John Connor’s lab, and many others, are working on a rapid diagnostic test for Ebola. Why would that be useful? Bhadelia: It would be important because Ebola causes fever, nausea, vomiting, and diarrhea. Everything causes fever, nausea, vomiting, diarrhea. Actually, for the most part, Ebola patients look like cholera patients. And so people have suggested that we probably have missed smaller outbreaks that just never get diagnosed because nobody sends the blood. Also, when we do Ebola response we take everybody who fits the case definition and we put them into the Ebola Treatment Unit. And so now these people are waiting around in the ETU, even if they just have malaria, next to somebody who might turn out to be positive. And in my mind, that’s a huge human rights injustice. With a rapid diagnostic, someone comes up at the door, you do the rapid diagnostics, they’re negative, done. Bhadelia: This was a hard thing in the West African outbreak, because some of these people didn’t have anywhere else to go—all the clinics had closed down because nobody wanted to, by accident, treat an Ebola patient without protection. A rapid diagnostic might change the model. You could have a clinic right next to the ETU where, if they’re negative, they just go and get malaria treatment and go home. How long does the diagnostic test take now? Bhadelia: If you are at an ETU with a lab next door, maybe less than a day. If you are more distant and blood work has to be sent out, two, three, four days. Connor: We are trying to get diagnosis to take under an hour. We’ve really been focused on trying to develop these so that you don’t need a tremendous amount of preparation or high technology. You have an instrument you can put in a backpack, you can take tests that are freeze-dried and fit in a little foil pouch, so that you can walk out to the point of need. Has the treatment for Ebola changed since the last outbreak? Bhadelia: Treatment hasn’t changed since 1976. We give patients fluid and hydration, give them treatment for anything else it could be (like malaria), give them antibiotics, and you control their symptoms. You make sure they’re not nauseous. You control their pain. And some people survive just by fighting it off? Bhadelia: Good supportive care can have a huge impact. Mortality is not just a reflection of the disease. I think it’s a reflection of the kind of care that people get. So improving supportive care, I think, has got to be the first step. Are there any effective antivirals? Bhadelia: Nothing tested in West Africa was a slam dunk. ZMapp was the one that came closest, showing—potentially—a 10 percent decrease in mortality in people who got it versus not. But the trial had to be stopped because it was the end of the outbreak. Do you have any plans to go back for this outbreak? Bhadelia: No. I’m going to Uganda. I work with a [US] Navy-funded project where they built an advanced Ebola Treatment Unit at the border of DRC and Rwanda in Uganda. That area has, according to their calculations, potentially a 33 percent chance, any year, of having a filovirus outbreak. What are you going to be doing there? Bhadelia: I train a huge cadre of healthcare workers. I think we, as healthcare workers, have to really make an effort to break down the barriers with patients, and that applies not just in West Africa but here too. If you get a patient who has a highly communicable disease, we have to put science into perspective and say, “This is still a person in front of us.” It’s not the disease in front of you; it’s the person in front of you. And that’s really what I try to instill in my healthcare workers here as well. The conversation has been edited for clarity.